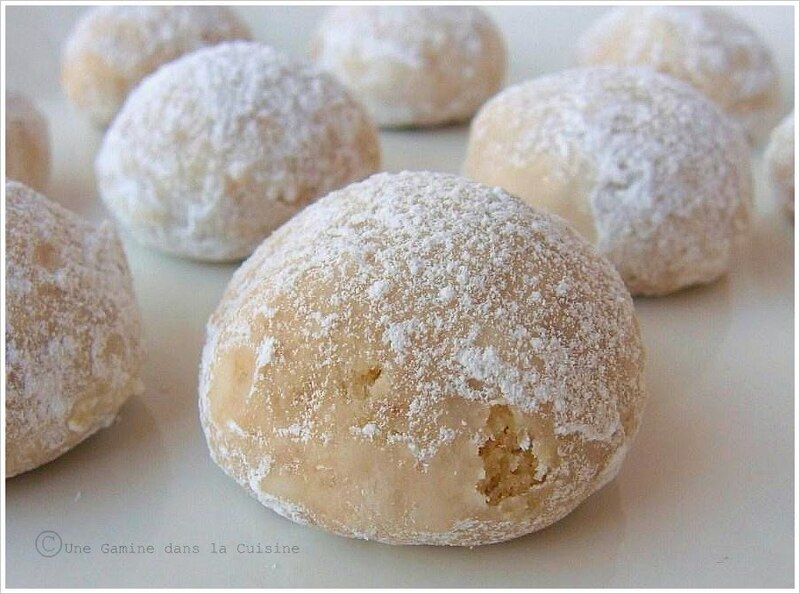 These cookies are also known as Mexican wedding cakes or, just pecan puffs. But whatever you call them, they're a Christmas-time favourite, and until now, I've never been a huge fan. What used to turn me off was the involuntary choking that resulted from the loose coating of confectioners sugar...of course that may be due to the way I inhale baked good during the 'it's-perfectly-permissible-to-be-bad, Holiday season'. For some reason, this particular recipe didn't induce any throat tickling, in fact, I was finally able to enjoy the cookies for what they truly are, delicate, crumbly, softy sweet confections that practically melt in your mouth before you're even finished chewing the first bite...of course this could be due to the fact that Summer is rapidly approaching (no thanks to the cold weather) and, although my jeans say otherwise, I'm no longer inhaling as many sweets. At any rate, I almost skipped this recipe because I didn't want to be tossed back into the throws of winter (no offense, Holiday season, but I was so over you by mid-January). Instead of using the called-for cinnamon, I added the zest of one lemon, because, let's face it, citrus and I are too tight to not be bffs again. Lemon shaker pie what? This week's recipe was chosen by Tianne (Tia) of the fabulous blog, Buttercream Barbie. Thanks, Tia. I'm now officially a pecan powder puff girl! For the recipe, please visit Tia's blog by clicking here. yours turned out perfectly. great addition with lemon. I loved these! Beautiful!! Who wouldn't want to take a bite of one of these! I'm ready right now even though I haven't had breakfast yet! Awesome photgraph! These look great! And thanks for the lemon variation; you know I'll be trying that version for sure. They look so pillowy! I've yet to try the Mexican wedding cookies, although I've got about a dozen versions bookmarked. I like the citrus twist in yours. This looks light and fun to eat. These are beautiful. Mine fell into a pile of crumbs. Should I try to make these, again? Your cookies are so pretty and I think a citrus version would be amazing. Great job, everything on your blog looks absolutely delicious! I died, I just died reading this recipe. I love lemon anything!!! Great idea to use lemon to brighten up these cookies. you are so inventive! now these cookies go from christmastime to springtime! i love it. Thanks for joining me in this week's TWD. Take care! Anyway, these look so delicious...! I have never heard of these, but I imagine that they would be fabulous! I love lemon or nutty flavours. Thanks for sharing this unique recipe. Lemon would be divine with these! I'm with you, I'm tired of winter and I'm ready for spring. Wow, these look so delicate and beautiful. I will bet they are delicious! Fantastic work, Valerie! mexican wedding cookies are my favourite. 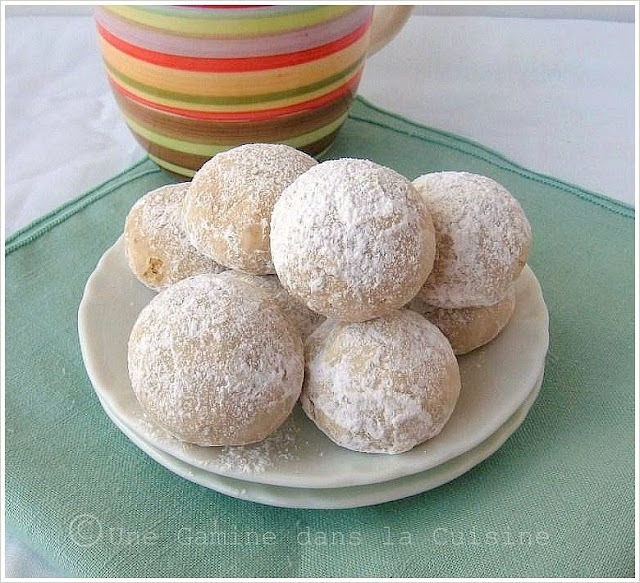 These look so adorable with the powdered sugar all over them. These are a favorite around my house...my daughter loves them. I've never made them with lemon though. Will have to try it. I never make these for anything but Christmas either and am wondering why. I use my Grandmother's recipe which is in an 85 year old cookbook that my non cooking cousin has (how fair is that?). My Grandma would roll over in her grave if someone called them Mexican Wedding cookies...they were Pecan Butter Balls and a part of her Scandinavian heritage! The lemon is unique and I should try it; checking out Dories book now to see how similar our recipes are. Thanks for sharing! I hate that throat drying confectioners sugar thing too. These cookies look good though, the sugar doesn't seem as much! They look so lovely and delicate!